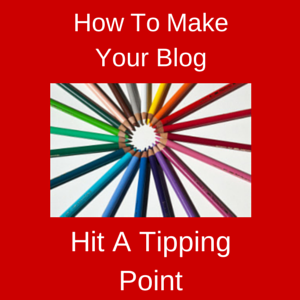 The tipping point is one of the most desired points to hit for any blogger. The tipping point represents a giant surge of traffic that increases beyond expectations. It is the type of traffic that takes a blog from a few hundred visitors every month to thousands of daily visitors in a relatively short period of time. Promoting your content only goes so far. One thing that determines your success as a blogger is how many people promote your content. Few people are capable of making content go viral on their own. Only the Oprah types can accomplish such a feat. 99% of the time, content goes viral when the people in your audience share that content with their friends, and those friends share the content with their friends. Repeat the process a dozen times with each friend, and then you have viral content. However, people are not going to talk about your content just because it is there. People primarily talk about extremely poor or valuable content. The poor content gets bashed while the valuable content gets praised. Valuable content is the content that wins on the web and gets shared the most. Valuable content results in more returning visitors and stronger relationships between you and your readers. Don’t be afraid to provide free value on your blog. In many cases, it is the free value that encourages the sale. So you’ll make more money anyway. You have to listen to me on this one. I started focusing on my email list a few years after creating this blog. That was by far, undoubtably, without question the biggest mistake I made with this blog (I’m emphasizing this for a reason). Out of the first 100,000 visitors who visited this blog, I didn’t even get 300 subscribers because my blog was poorly optimized to get more subscribers. Your email list is so important because it gives you an easy way to communicate with your subscribers, and the click through rates are incredible. Even if you only get a 5% click through for your emails, that is a much higher statistic than the percentage of click throughs you would get on social media (almost always under 1%). Some marketers go as far to say that the size of your email list indicates your income. Most of the successful bloggers who make six figure incomes have over 10,000 subscribers (although having 10,000 subscribers does not guarantee a six figure income, having that many subscribers is very helpful). These blogs get a surge in traffic when an email blast gets sent to subscribers promoting the latest article. Imagine having a list of 10,000 email addresses, and 7% of those people clicked on the link. That’s an extra 700 visitors just from that one email. Some of those visitors may decide to share the blog post on social media (very helpful for SEO) or write a blog post about your blog post. Most of the blog posts that I promote on this blog (that aren’t mine) are blog posts written by Seth Godin. I’ve been reading his emails every day for over two years. That’s not a coincidence. I typically share links to blog posts that I read in my inbox first. Don’t make the same mistake I made. Build your email list now. It is your number one priority for turning blogging into a full-time income. Once you write valuable content and have landing pages set up to collect email addresses, those pages need visibility. The web is a noisy place with millions of blogs. Someone finding your blog (or anyone’s blog for that matter) is like finding the needle in the haystack. Some needles in the haystack get found more often than others. In order for your needle (blog) to be found in the haystack (the web) more often, you need to promote your content on social media. Not only is building your social media audience a great way to promote your content, but it is essential towards establishing your authority on the web. Having a large social media audience gives you better social proof. Think about it this way. Would you rather buy the Twitter guide from the person with 100 followers or the person with 100,000 followers? Would you rather take the Facebook course from the trainer with 1,000 Facebook likes or the trainer with 1 million Facebook likes. When you grow your social media audience, you can use the social proof to boost your credibility. No matter what you do, never resort to buying fake followers. Not only does it hurt your credibility, but the fake followers will never engage with you. They will also make your real followers feel uncomfortable. Here is an interesting case study from Social Media Today about someone who bought 50,000 Twitter followers (and was disgusted by the results). To many bloggers, SEO is still confusing. The main reason SEO seems confusing is because there are so many factors that go into a search engine’s ranking system. Some search engine tactics such as adding alt tags do not necessarily improve the value of your blog posts. Those types of search engine improvements are the ones that get done behind the scenes so search engines can understand what your blog is about. My recommendation is to only learn a few SEO methods at a time and implement them one by one. Focus on improving your blog’s bounce rate, linking to your other blog posts, including alt tags in your pictures, growing your social media audience (that helps with SEO) and writing longer blog posts (while keeping the value). My recommendation is to master one of these tips at a time and then move on to a new set of tips. You can start with any five tips you desire. I wrote a blog post that contains a few more tips about boosting your blog’s SEO. If you want to make it to the next level in anything, then you have to put in the next level of work. The more time you commit to blogging, the farther you will go. If you spend twice as much time researching different tactics you can use to boost SEO, get more subscribers, and grow your social media audience, then you will have twice as much knowledge in those areas. If you spend twice as much time writing content, then that content will probably be longer and more valuable. It is possible to reach a tipping point for your blog, but reaching that tipping point (or anything important and worth the time) is not an easy task. I wrote blog posts every day even when I knew no one would see them. It was the process of writing every day that allowed me to get better, learn new tricks, and turn my blog into what it is today. A blogger’s journey is one of persistence. For the average blogger, it takes a few years before his efforts turn into a full-time income. Every blogger, even the most successful ones, started out with no audiences of their own. Successful bloggers had to fight their way through the noise as they grew their email lists and social media audiences. It takes months of research to master SEO and a few weeks of research to learn what happens when Google comes out with a major search engine update. If you are persistent, and you learn new techniques along the way, then you will become a successful blogger. Be patient, continue to put in the work, and success will greet you on the other side. Tipping points take a lot of work to pull off, but any blogger can experience a tipping point, the moment when traffic soars more than ever before. Even the most successful bloggers experience tipping points in their social media audiences, blog traffic, and the number of subscribers they get. The key to becoming a successful blogger is by being persistent and learning new techniques along the way. Which tip was your favorite? Do you have any additional tips for bloggers who want to reach their tipping points? Please share your thoughts and advice below.